You are currently browsing the tag archive for the ‘oxidatized’ tag. Since the end of last year, I have been working on a number of new Treescape pendants. This is one I call Fulfilled. 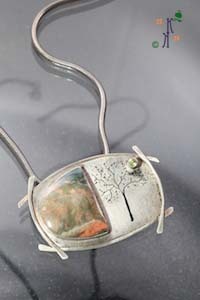 At last Saturday’s trunk show, there were some interesting reactions to this piece. I think people found it quite unusual with the stone set on one side and the tree piercing on the other with a faceted peridoit tube set. It was a bit challenging to fabricate because the tree design required a backing to support it. I did one in copper in the shape of the tree that was overlaid to the back. It certainly makes for an interesting hidden element. Why did I call this one Fulfilled? Well, I must admit this had been sitting on my bench for while. I had started this during the Open Studio Tour last September, because I felt it was an interesting piece to discuss how the fabrication takes place. Once I finished the piece, I definitely experienced a wonderful sense of fulfillment and so it earned that title. The stone is Morrisonite, set in sterling silver that I’ve oxidized. The finished work is fun and a definite eye catcher. Stay tuned for more Treescapes.